A report released by Amnesty International, Left in the dark: Failures of accountability for civilian casualties caused by international military operations in Afghanistan, investigates widespread civilian killings that have been carried out in recent years under the US-led occupation in Afghanistan. Amnesty investigated nearly a dozen instances of mass killings by NATO and International Security Assistance Forces (ISAF) that took place between 2009 and 2013. The report focuses on the role played by US official occupying forces due to their numerical preponderance in the ISAF, the main international occupying force in Afghanistan. This is largely due, the report states, to a military justice system which is “commander-driven” and based upon “self-policing.” In other words, war crimes are generally carried out with impunity. Though crediting forces such as the Taliban for the majority of civilian deaths, the authors note that this statistic is largely due to the drawdown of occupying forces and the shift to native Afghan forces. 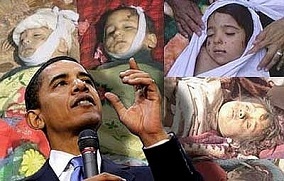 It states that in the first eight months of 2007 alone, “pro-government forces” led by the US were responsible for nearly half of all civilian deaths. The report details several events in which vast numbers of civilians were killed by ISAF operations. * The September 4, 2009 strafing by F-15E fighter jets of two fuel tankers on the Kunduz River, which occurred after authorities had reported the vehicles stolen by militants. The report notes that “Rather than abandon the vehicles, the militants opened the tanks to siphon off the fuel,” encouraging locals to do the same. “Dozens of men and boys rushed to the area; people were doing what they could to bring free fuel home,” the report quotes a bystander as saying. ISAF commanders ordered the vehicles destroyed. At 1:20 am the following morning, the two jets fired on the tankers with several 500-bomb guided bombs, killing as many as 142 people. * The killing of five people, including two pregnant women, at a party in Paktia province on February 12, 2010. US Special Forces members raided the home of then-70 year-old Haji Sharabuddin, who had been hosting a family event to celebrate the birth of his grandson. After demanding that the party goers “open up,” the team of elite commandos shot anyone who came to the door, including the two pregnant women, who had attempted to prevent others from being shot. The report quotes a UN Special Rapporteur saying that nighttime raids in particular “are always dangerous for civilians,” before adding that there is no accurate accounting kept by the occupying forces of the civilian death toll such actions have produced. The only military bodies tasked with monitoring civilian deaths, the Joint Incident Assessment Teams (JIATs), are largely toothless, possessing no “investigative function,” the Amnesty report explains. The deployment of such bodies is usually undertaken only for “incidents that have resulted in a high number of civilian casualties or that have received political attention,” in other words rendering them unable to be ignored. The most well-known of such incidents was the March 2012 killing of 16 Afghan villagers by US army sergeant Robert Bales in Kandahar province in southern Afghanistan. At the time, numerous politicians, including President Obama and then-US Secretary of State Hillary Clinton, were trotted out in order to brand Bales a “rogue soldier” and justify the overall aims of the occupation. In fact, as the report shows, far from being the actions of a “bad apple,” atrocities such as the Kandahar massacre are common and often go unreported by the military occupiers of Afghanistan, for whom oppression of the population is central to the bloody aims of US imperialism as a whole. The report is also unable to determine the number of similar incidents involving the nearly 100,000 private military contractors operating inside Afghanistan. Considering the preponderance of such forces, as well as the virtual nonexistence of oversight involving these groups, one can only assume such incidents are even more widespread in the private military sector. Other known causes of widespread tragedies include the use of Unmanned Aerial Vehicles, or drones, a mainstay of the Obama administrations’ battle strategy, as well as incidents at checkpoints involving civilians misinterpreting an order, resulting in summary killings. The so-called US “withdrawal” from Afghanistan declared by Obama in May of this year would continue to leave roughly 10,000 troops in the country through 2015 and will be subject to the government granting blanket immunity to all US forces.